In January of this year, I walked into the Lenovo booth at CES and almost immediately to the right there was a large display case set up, and inside was Eve. Eve looked great in the case all dressed in black, and was well attended to by her hosts. Eve is the one hundred millionth ThinkPad to be created, and I remarked at the time that it was likely not an accident that Eve is a ThinkPad X1 Carbon. 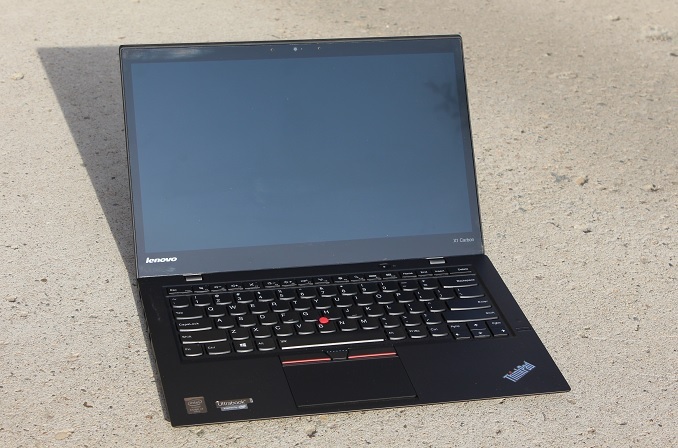 The X1 Carbon has been Lenovo’s flagship ThinkPad since it was launched, and it brings the world of the ThinkPad business class notebook down into a much thinner and lighter form factor. Today we have the third generation of the X1 Carbon, and although the competition for the best Ultrabook keeps increasing, Lenovo brings a lot to the table with the X1 Carbon. Lenovo keeps the ThinkPad lineup outfitted with features that the average consumer does not need, and the price is higher accordingly. But if you are someone who travels a lot, and needs a full featured notebook with all of the goodies, you can find it in this X1 Carbon. While the Ultrabook initiative started out with smaller devices, it gradually worked its way up to include larger notebooks as well, and the X1 Carbon certainly fits the bill for an Ultrabook despite the larger than average 14 inch display. Despite the somewhat larger chassis, the X1 Carbon keeps the weight in check partially through the use of its namesake – carbon fiber. The display cover is created with carbon fiber reinforced plastic, and glass fiber reinforced plastic. This lets the display be lighter, thinner, and stronger than one made of aluminum or plastic alone. And it is strong. You can certainly flex the display, but it never feels like you are going to bend it by accident. The bottom of the X1 Carbon is made of aluminum and magnesium, so it is plenty strong as well. Lenovo even points out that the X1 Carbon has passed eight MilSpecs with fifteen individual tests, including shock, vibration, temperature, humidity, and silica dust exposure. 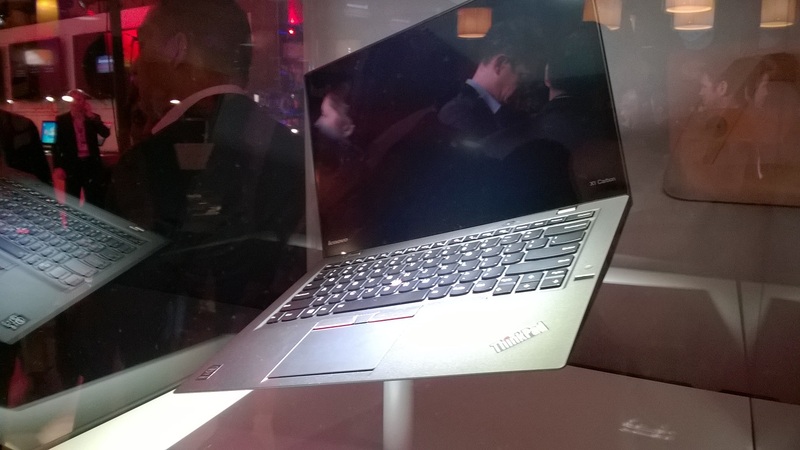 For many devices, 2015 is the year of the spec bump to Broadwell based processors, and Lenovo is not immune to this. Luckily that is a good thing though, and the new X1 Carbon is now powered by the latest Broadwell-U based processors from Intel. Buyers get a choice of the i5-5200U, i5-5300U, or the i7-5600U processor. None of these are slow, but luckily Lenovo has sent us the i7 model so we can get a feel for how it competes against some of the other Broadwell devices we have seen this year. Let’s take a look at the full specifications below. Since this device falls into the ThinkPad line, you get a lot of customization options when purchasing that Lenovo does not do for their consumer models, and that is very welcome because on a lot of devices if you want feature X you have to also buy features Y and Z, which can really bump up the costs. However a few things need to be called out on the X1 Carbon. This is a premium Ultrabook, so it is a bit sad that in 2015 the base model is still offered with just 4 GB of memory, and because this is soldered on (like all of these very thin devices) it would be money well spent to just add the extra $75 Lenovo charges for the 8 GB model. Luckily even though Lenovo calls it 1x8 GB in the guide, it is in fact dual-channel memory. The other big complaint is the 1080p model is offered with a TN panel. That is not really acceptable in a $1000+ device in 2015 any longer. Moving to the QHD version of the panel for $150 would be money well spent since that will bring you an IPS panel. There are also a lot of options for storage, and the base model comes with just a scant 128 GB of SSD space available, but for not too much more you can bump that up to 180 or 256 GB. For those that need even more storage space and speed, Lenovo offers the SM951 equipped 512 GB PCIe based Samsung SSD. When the X1 first launched, it was a hefty $700 upgrade, but now it is a mere $425 over the base 128 GB offering. The X1 Carbon is even offered with optional LTE connectivity, via the Sierra EM7345, for those that need mobile data connectivity without tethering. Lenovo has destroyed the Thinkpad name. They destroyed it years ago. The only high-end corporate laptops to consider are HP Elitebooks\Zbooks and a handful of Dell's. Every Thinkpad I've interacted with over the past few years is either on a replacement battery, has cracked USB ports with bent fingers, overheating issues causing flaky behavior, or a combination of these. Then there is the support, which is downright awful. Lenovo is notorious for throwing end-users under the bus, especially once they're out of warranty for such widespread symptoms that they should be recalls. The T420 and T430 where IBM designs. It wasn't till we switched over to the 540/440 series that it was done "in house." And looking at how they where built, I have zero confidence in them for long term durability vs the older series. It was of IBM design, using the same suppliers and tolerance levels.